Researchers announced today they discovered wreckage of the lost warship the USS Indianapolis, 72 years after the World War II cruiser was torpedoed by a Japanese submarine. 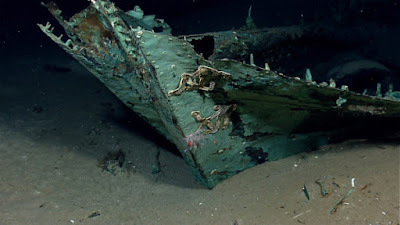 The wreckage was found in the Philippine Sea 5.5 km below the surface, according to philanthropist Paul Allen, who headed the civilian research crew that located the ship. The ship was hit in the final days of World War II just after completing a secret mission delivering parts of the atomic bomb used in Hiroshima. The vessel sank in just 12 minutes, meaning it was unable to send a distress signal or deploy life-saving equipment, according to the history division of the US Navy. Some 800 of the ship’s 1,196 sailors and marines initially survived the maritime disaster, but only 316 ultimately lived after enduring several days in shark-infested waters where they also faced risks of dehydration and drowning. Of those survivors, 22 are still alive today, the US Navy said. » A woman was found dead on the couch of her London apartment 3 years after her death.